Guy Garnder does the online dating scene? Find out on Sketch Lottery. Sketch by Michele Witchipoo July 2014. 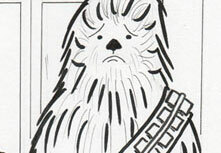 The latest sketch I contributed to the Sketch Lottery website. Green Lantern’s Guy Garnder does the online dating scene. Having a profile on OKCupid was the first thing that came to mind when Guy Garnder was selected as this week’s character. Especially since he seems to have this ‘machismo’ quality about him. You can look at my sketch here. Already blogged about this, but here’s a repeat. I have a shop on Esty under the banner WitchesBrewPress. There’s comics and original art for sale. Unfortunately Babalon Babes issue four from 2009 (astrology issue) is now sold out. You can still purchase Psycho Bunny mini-issue #3.25. Banner for Michele Witchipoo’s Esty store. It’s been a very long time since I’ve done anything, art or writing wise relating to 23. It’s been a while since I’ve done anything relating to esoteric for that matter. (Stopped being active back in 2009) When I first started putting together my own self publish comics and illustration, I threw in a lot of symbolism. The number 23 was occasionally used. I first heard of the 23 engima thanks to Re/Search Books back in the early ’90s. My first Re/Search book was ‘Modern Primatives‘ which talked about body modification and tattoo culture. This was way before the two subjects hit the mainstream. Inside the book was an interview with Genesis P-Orridge and his then-wife Paula P-Orridge (first wife). Genesis mentions the number 23 and the William S. Burroughs connection within this interview. This interview was also the first time I had learned about Aleister Crowley. So in a way, this was a portal of sorts. Subconsciously, I noticed the number 23 more. My curiosity got the better of me, so I requested some information about T.O.P.Y. This is dating back to 1991 or 1992. When I received the magazine sized zine, it came with instructions on how to join TOPY. However at the time, despite the fact that I had already self-taught myself how to read tarot, and had dabbled slightly, this particular information was all a bit too heavy for me to deal with. My interest in anything occultist was pushed aside my until the early 2000’s. Fast forward to the year 2006. I was in Lawrence, Kansas where William S. Burroughs spent the last ten years of his life. On an impulse I got a small tattoo of the number 23 on my inner right wrist. These links might help explain the 23 enigma more here and here. Ending this post is are old sketches. The first one is from 2005, very Psychic TV/TOPY influenced. Looking back, I regret not initially going forward with the early instructions. Then again, I just wasn’t ready. 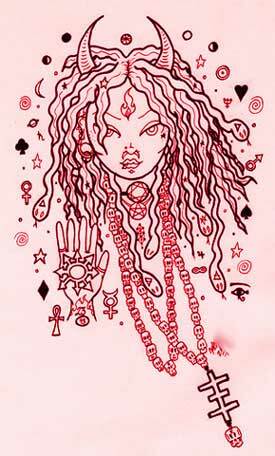 Psychic Kali by Michele Witchipoo, done back in 2005. The second one was started in 2007 and completed in 2008. Believe this was published by AIN23 in 2009 or 2010. Would have to check up on that. In the meantime, enjoy and happy 23. Chaos Mama by Michele Witchipoo back in early 2008. Hail Eris! Join The Eris of The Month Club Today! As mentioned recently, I joined the management team for the Historia Discordia website. So with that, it is my duty to inform you that there will be now an Eris of The Month Club. The first Eris featured was something I did for Adam Gorightly back in 2009. All Hail Eris! 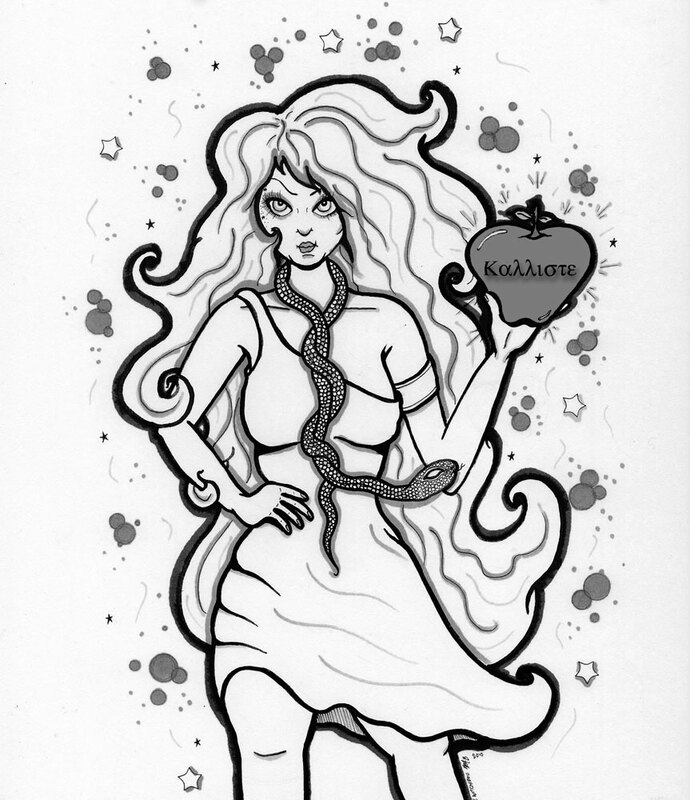 Eris of The Month, originally drawn back in 2009 by Michele Witchipoo. *For a simple explanation, try this Wikipedia link. *To order your own copy of Historia Discordia: The Origins of The Discordian Society, click here. Latest news. I was asked to be part of the “management” crew for the Historia Discordia website. 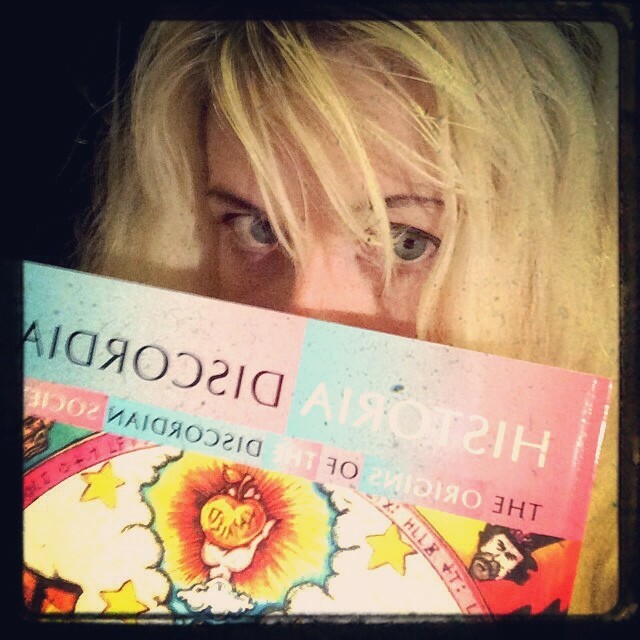 Michele Witchipoo posing with the book “Historia Discordia” written by Adam Gorightly, Photo taken June 2014. The Historia Discordia website, named after the book ‘Historia Discordia: Origins of the Discordian Society’ written by Adam Gorightly, not only focuses on the book, but on Discordianism itself. What the hell is Discordianism you ask? Well, you can read about it here, here, and here. Still scratching your head I see. Well nevermind. “Historia DIscordia: The Origins Of The Discordian Society” written by Adam Gorightly. 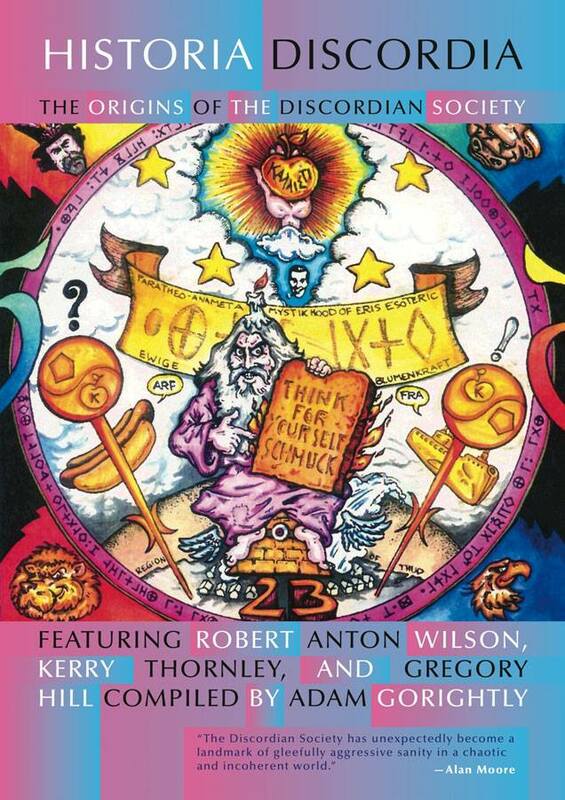 With a foreword by Robert Anton Wilson. You still order your own copy from RVP Press via Amazon, and be one of the coolest kids on the block. I have an illustration in that book as well. Oh yeah, and this book also has a Facebook page. So get on it. Fnord. 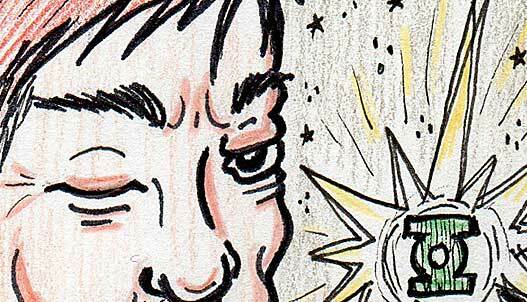 Submitted another sketch to the blog Sketch Lottery. This time of Drizzt Do’Urden. Prior to this, I was not familiar with this character at all. He’s associated with the Dungeons and Dragons realm, as this site might explains Drizzt’s background. Never played Dungeons and Dragons, not ever. Yet I’m always up to drawing new things, so this was considered somewhat of a challenge. Here’s the link for my version of Drizzt, as done for Sketch Lottery.